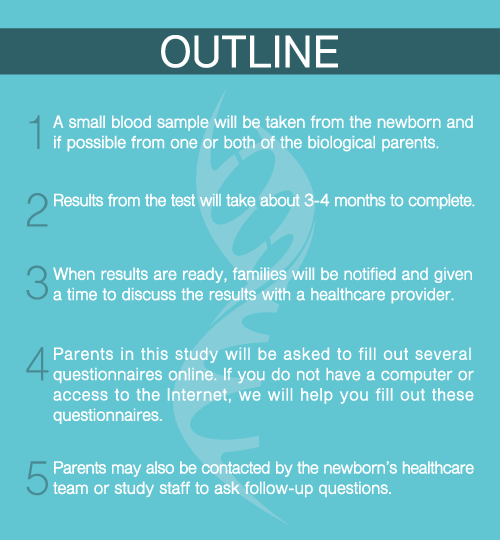 SouthSeq is a NIH-funded research study looking at how a new kind of genetic test, called whole genome sequencing, can be used to try to find the reason for medical problems among newborns in a neonatal intensive care unit (NICU). The whole genome sequencing test looks at a person’s entire genetic code. The test looks for a genetic change that may be the cause of a medical problem. We believe doing this test in a NICU can allow diagnoses to be made earlier and may help doctors provide better care and treatments. The reason for the newborn’s medical problems or unusual physical findings. Other genetic changes that may be important for the family’s medical care. Genes are the sections of DNA that provides instructions for the human body to grow and work properly. A human genome contains about 22,000 genes. All of a person’s DNA is called his or her genome. All people have changes in their DNA. Genetic changes can range from very small to very large. Most genetic changes are not related to a medical problem. Some changes are harmful and cause disease. These are the types of changes we look for in this study. The SouthSeq project (U01HG007301) is supported by the Clinical Sequencing Evidence-Generating Research (CSER) consortium which is funded by the National Human Genome Research Institute (NHGRI) with co-funding from the National Institute on Minority Health and Health Disparities (NIMHD) and the National Cancer Institute (NCI). More information about CSER can be found at https://cser-consortium.org/.